It’s pie season. Specifically apple pie season. But guess who hates pie? 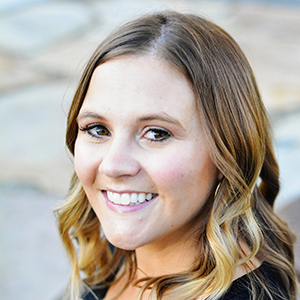 Not me–whoa no no. I love pie. It’s my husband. He’s never liked pie, except for key lime pie. I was pretty sad about this the first year we were married because I wanted to be all domesticated and make pies like a good little housewife. But then one day we went to a church function and a lady there served the most delicious apple pie–apple crumble pie. And my husband raved about it! I begged her for the recipe since I finally found an apple pie recipe that he would eat. And this, my friends, is that pie recipe. Mix up all the ingredients in a mixing bowl and then pat into a pie pan. Do not roll out. Peel and cut up 4-5 large apples. I used some Golden Delicious fresh from my mom’s apple trees. I used those cool spinny apple slicer tools that make short work of apples. Turn ’em into little apple slinkies. Then I chop them up and mix in the other ingredients. 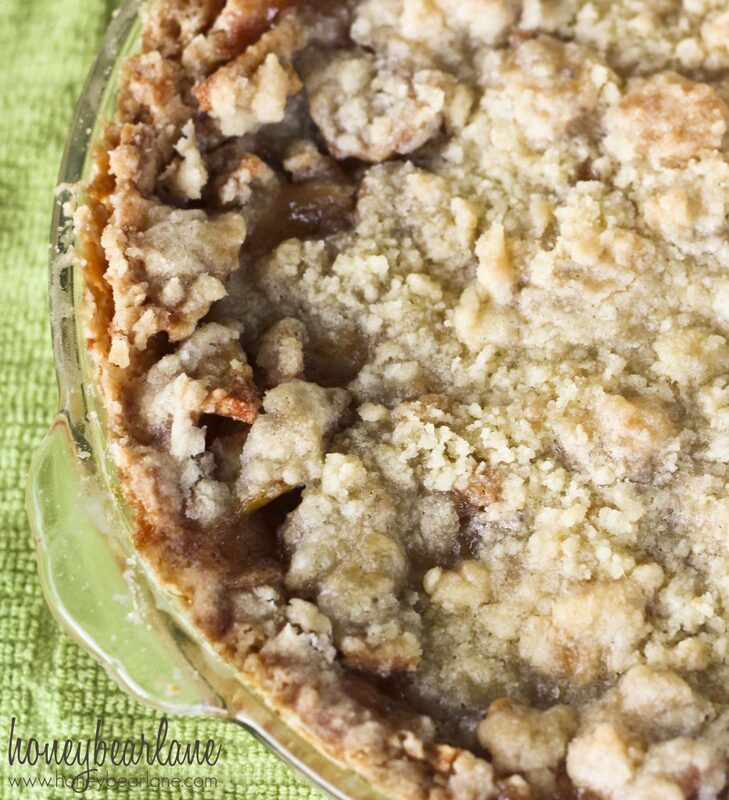 Put your apples into your unbaked pie shell. Cut up your butter into little cubes and then mix in the sugar and flour until they are in little crumbles. Put on top of the pie. Put the whole pie into a brown paper bag and seal. Bake it at 350 degrees for 1 1/2 hours and don’t peek! Serve with vanilla ice cream! 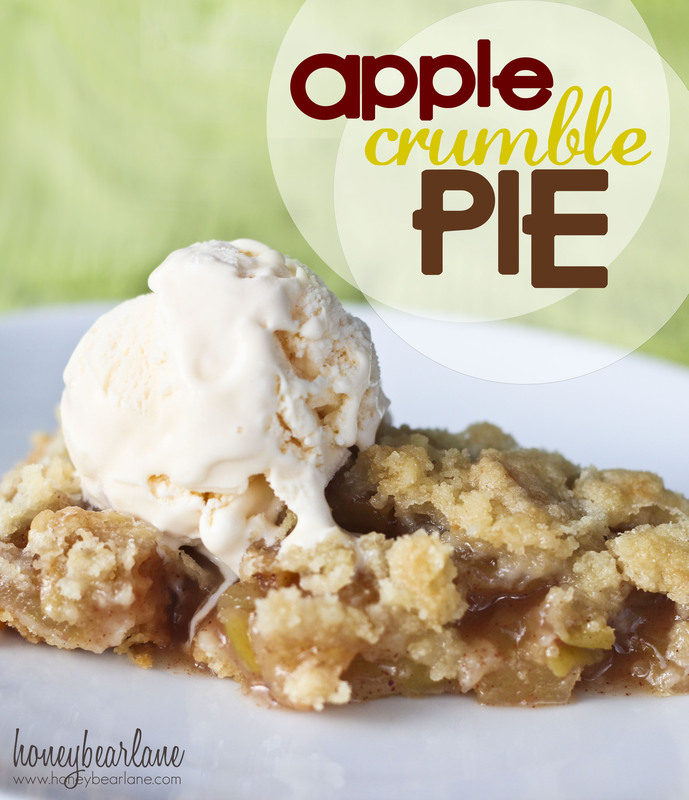 Crust: Mix up all the ingredients in a mixing bowl and then pat into a pie pan. Do not roll out. Filling: Peel and cut up 4-5 large apples. I used some Golden Delicious fresh from my mom's apple trees. I used those cool spinny apple slicer tools that make short work of apples. Turn 'em into little apple slinkies. Then I chop them up and mix in the other ingredients. Put your apples into your unbaked pie shell. 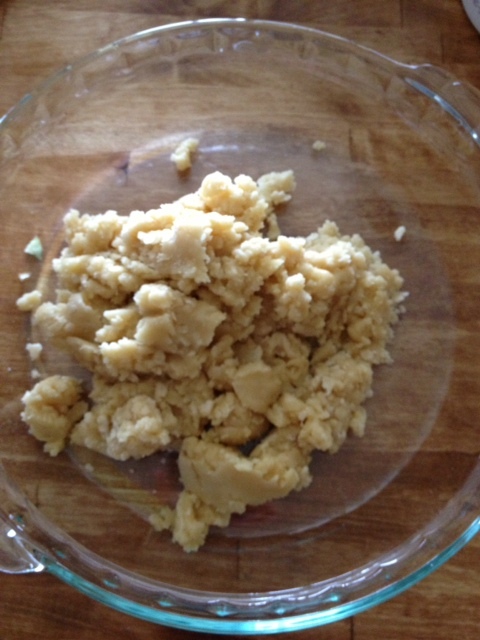 Topping: Cut up your butter into little cubes and then mix in the sugar and flour until they are in little crumbles. Put on top of the pie. Put the whole pie into a brown paper bag and seal. Bake it at 350 degrees for 1½ hours and don't peek! Serve with vanilla ice cream! Sounds and looks DELICIOUS!! I’m definitely trying this recipe. Quick question…what type of “seal” is required with the brown paper bag? I just folded it over! It’s really yummy and easy–go try it! How wonderfu,l this looks yummy. 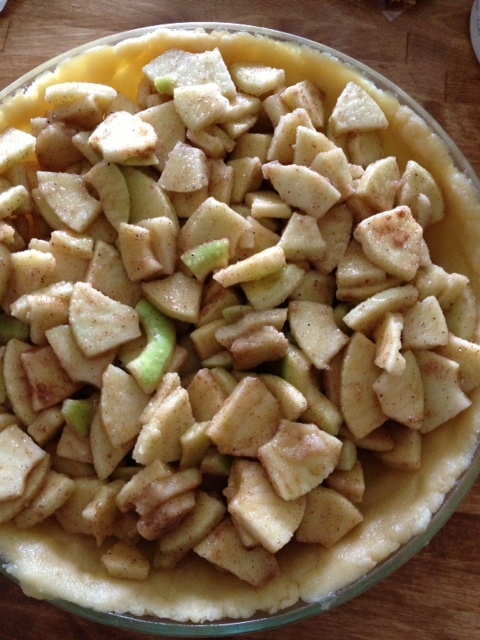 I do love apple pies, especially this time of year…….ok anytime of year. Thanks Tauni! It’s a great recipe–so fast too! This looks sooo good I am defiantly going to try this! My husband also informed me that he didn’t like pie the first year we were married and I freaked a little. I love pie and I love to make pies. After he tried an apple pie I made he said maybe it was just the recipe and then ate half my pie. I fell in love a little more that day . Quick question though: are we talking like a regular old Winco brown paper grocery bag? What is the purpose of the bag? This seems dangerous to me 🙂 Thanks for the help! I think the brown bag helps it to stay moist and to not get burned because it cooks for so long. I put the bag (with the pie in it) on a cookie sheet and make sure the sides and top aren’t touching the oven. It’s all good! 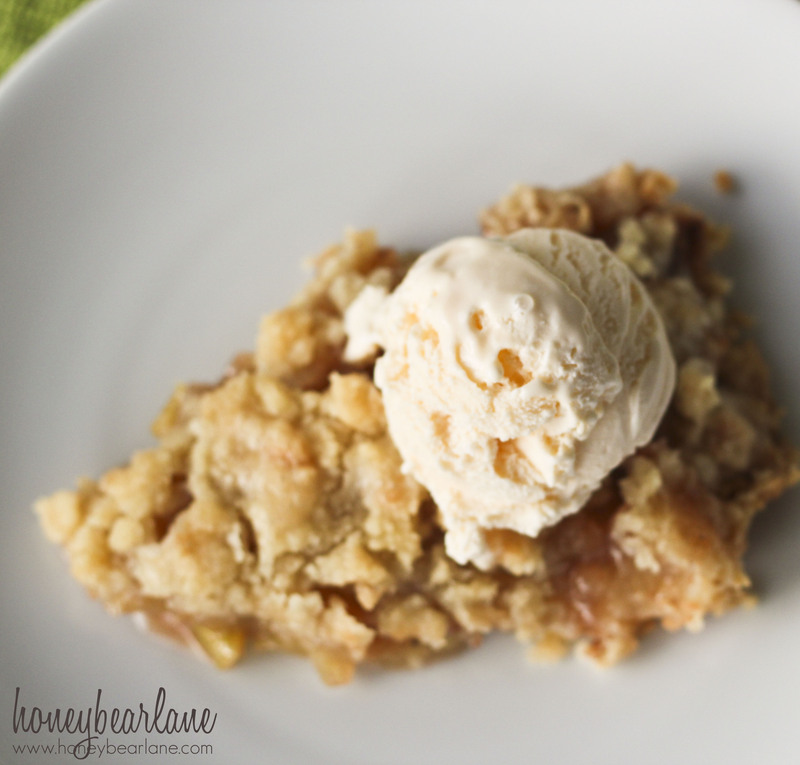 1 And the pie……..so amazing….crispy outside and soft and tasty inside! Everyone loves it! This will be a family favourite. Thank you Marleen!! I know that it can be a little nervewracking putting the paper bag in the stove but as long as it’s not touching the sides of the oven but I just tuck it in there neatly. And yes–it does turn out amazing!! I’m not sure because I’ve never tried. You could try making a ‘bag’ out of tin foil but I’m not sure that would create the same result. If you put the pie and bag on a cookie sheet and make sure it doesn’t touch the sides or top, it should be fine. Just keep an eye on it if you’re nervous. This recipe looks sooo good! Question: Think it is possible to add oats to the topping? Thx!! Thanks–it is good! I’m sure you could add oats, doesn’t hurt to try! OK I made it and it was a HUGE hit! (we didn’t use the oats this time though). 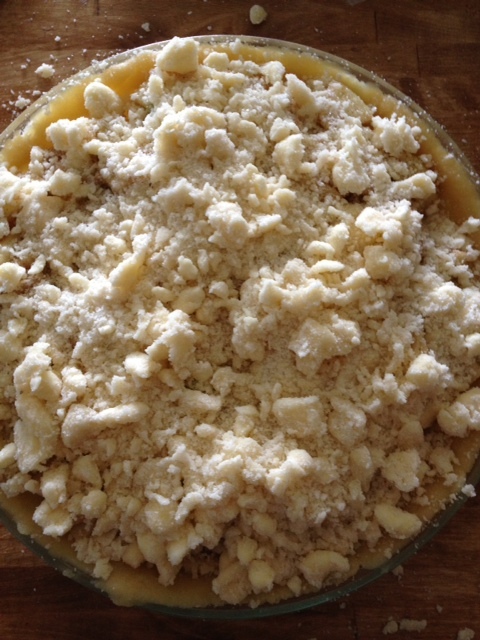 My new question is that when I made the crumble top it wasn’t really…crumbly. I followed the instructions but everything just kind of blended together like a batter, not like crumble. I used cold butter, any ideas what could have gone wrong? They trailed after the Cowboys went 59 yards in 11 plays, including a 21-yard catch by Jason Witten on fourth-and-6. There were also two defensive [url=http://www.outletjerseys.us.com/]Cheap Authentic Jerseys[/url] holding calls, the second on a third-and-7 play, before Tony Romo threw his second touchdown pass to Terrance Williams with 2:32 left. Many at [url=http://www.wholesalejerseyschinanfl.us.com/]Cheap NFL Gear[/url] Wednesday night’s hearing vented on Fabiani, criticized the plan to move to [url=http://www.nflchinacheapjerseys.us.com/]wholesale jerseys china[/url] Carson [url=http://www.cheapjerseysfastshipping.us.com/]Cheap [url=http://www.manchesterunitedfanshopuk.com/]Man Utd New Kit 2018/19[/url] NFL Jerseys[/url] and told stories about growing up Chargers fans. Many said they would not drive up the freeway to games if the team moves, and [url=http://www.wholesalejerseysforchina.us.com/]Wholesale Nike NFL Jerseys[/url] many [url=http://www.cheapshoesnikeaustralia.com/]Nike Shoes Wholesale Australia[/url] said the name Chargers [url=http://www.chinanflcheapjerseys.us.com/]Cheap Jerseys[/url] should stay in San Diego. Pittsburgh received an [url=http://www.nuevocamisetadelrealmadrid.es/]Uniforme Del Real Madrid[/url] unexpected boost from cornerback Ross Cockrell, signed off the waiver wire at the end [url=http://www.airmax97suomi.com/]Air Max 97 Osta[/url] of the preseason. Cockrell picked off Flacco to end one Baltimore drive in the second quarter and alertly scooped up [url=http://www.bizjerseysshop.us/]China [url=http://www.cheapnbajerseysstore.us.com/]NFL Jerseys From China[/url] Jerseys[/url] a fumble by Flacco early in the third that set up a 9-yard touchdown pass [url=http://www.cheapsoccerjerseyssale.us.com/]China Football Jerseys Cheap[/url] from Vick to Darrius Heyward-Bey as the Steelers took a 20-7 lead.